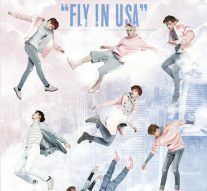 South Korean boy group, GOT7, flew to the USA for their first ever American tour last summer. There is no such thing as a language barrier when it comes to this group since more than half of them can understand English and at least three of the members can speak English fluently. The majority of their fans in the states do not speak or understand Korean, but it does not stop them from wanting to hear good music. Got7’s concert was definitely different from average concerts that happen in America due to their fan interaction moments, layout of the concert, and overall performance. GOT7, without a doubt, sure knows how to have fun with their fans. Throughout the concert, the boys were all very much into the idea of making the hearts of their fans swell with joy with the most discreet wink possible. After performing a couple their hit songs, GOT7 began to talk to their fans, getting quick chorus of responses from them. There was a special time during the concert where GOT7 acted as if the concert was over. The fans were ecstatic that GOT7 were going to come back onto the stage if the fans played a little game with them. Random fans were selected in to the audience and were displayed on the jumbotron of the concert hall. Each selected fan had to mimic the choreography from one GOT7’s music videos in order for the boys to return to the stage. Once that was over, the boys did not appear on the stage once the game was over, but they came through the entrances of the concert venue, walking through the fans. Some fans got pictures of the boys, got to dance with them, and even received hugs. At the end of the concert, the fans that were closest to the stage were lucky enough to have some of the GOT7 members to take their phone and take personal selfies on them. “I was really surprised that Jr., one of the GOT7 members, took my phone and was taking video on my Snapchat!” exclaimed Stephanie Hackleen, one of the many fans that attended the concert. Naturally, the overall performance of GOT7 was very spot on. It seems like the long practice hours that the group goes through back in South Korea shows when they are performing. They interact with one another and still keep in time with the beat of the song. Nobody was falling behind in the dance route; they were always in sync. The vocals of the main and lead singers were outstanding; being able to show off their high notes without any strain is always an A plus. The rap line of GOT7 did their parts so smoothly that there was no stuttering of words. “Youngjae’s high notes were so amazing! I’m so glad that I got to record my favorite performances,” states Marina Fiscaletti. In the end, GOT7’s first ever USA tour was a complete success. Fans were sad to see GOT7 leave, but they are coming back to the states for a fanmeet in late January of 2017. “Are you serious? I’m totally gonna go see them again,” said Olivia Anderson after she heard the news of GOT7 coming back for fun and games. Fans can expect more fan interaction moments, a better outline for concert, and be even more impressed by the inclusive performances that are yet to come.